Looking for the best pole saw for long tree pruning and taking plant cutting regularly? We’re dedicated to writing the honest best pole saw 2019 reviews to help you out to know more about the usage of pole saw. Having a perfectly trimmed lawn leading up to your front door makes the first impression to the people who visit your home. Your well-maintained lawn will express your taste and personality and also upgrade the architectural style of your home. Although maintaining a flawless lawn takes a lot of work. It takes mowing, pruning, fertilizing, aerating and watering. It is an enjoyable way to spend time in your garden if you have the right tools like pole saw to do the job. Today we will discuss the top 10 best pole saw 2019 to help you maintain a beautiful garden. The RM2599 Remington pole saw is a powerful yet well-priced gas powered pole saw. An excellent range of settings that reduce the difficulty of your pruning tasks around the garden. This gas pole saw scores a high point in all important areas. With high ratings on the web, this one is certainly worth looking at. Along with versatile design, this easy-to-use pole saw is designed to cut limbs and branches without a ladder. It has a powerful 25cc 2-cycle engine with QuickStart technology to make pull starts easy. You can purchase multiple attachments to the end including hedge trimmers, blowers, and etc. In that way you can use the pole saw as a multi-purpose tool that handles most modern gardening tasks. You can reach those difficult branch heights of up to twelve feet. And because of the power consistency of the pole saw. This also limits the amount of stress your body takes while cutting, mainly your arms and shoulders. The pole saw is extremely handy for difficult to cut areas. There is quite a small amount of kick back with an 8-inch bar and chain. The steel made pole offers the required strength and durability for daily performance. It measures 7feet in length to make light work of hanging branches from the ground. Overall, the Remington RM2599 with its several outstanding features makes the pole saw a great value for money. Along with its versatile design and happy customers, it certainly holds its own against the majority of its competitors available in the market. 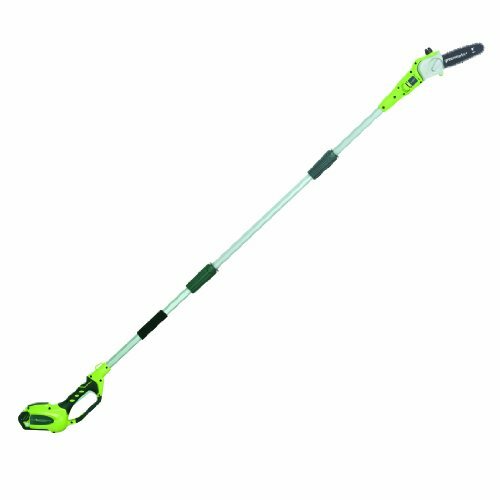 Thanks to the GreenWorks 20672 G-MAX 40V 8-Inch cordless pole saw, which makes trimming much easier. You can reach those hard-to-reach limbs and cut them easily with the simple push-button electric start, adjustable shaft, tool-free chain tensioning and durable 8-inch bar and chain. This pole saw is an excellent trimmer and you can do your regular trimming chores easily without having to deal with hazardous fumes. This Pole Saw offers very solid performance with no routine maintenance, and mainly a good choice for casual users who use saw a couple of times a month. With its powerful 40V G-MAX battery you can use it for hours, depending on the intensity of the works involved, on a single charge. The pole saw also features a 3-piece pole that extends up to 8 feet making it a perfect pole to tackle almost any size of the project. This particular model of GreenWorks comes equipped with a number of helpful features that make it stand out in a market filled with competitors. With automatic oiling and chain tensioning system, the performance of this pole saw what you are looking for. This is surely a great product with no major flaws and it is competing outside its league. Overall, you will not regret paying a little more for a product like this. The Sun Joe SWJ800E pole chainsaw is a perfect saw to enjoy a well-manicured yard. This outdoor tool comes from the house of the famous manufacturer Sun Joe. This time they came with an incredibly solid chainsaw that takes the danger and difficulty out of trimming your overgrown trees. Weighing only 8 pounds it is one of the lightest electric pole chainsaws around. The saw is portable and designed for optimal comfort. Making it much easier to handle than many other saws in the market. The saw is designed for optimal comfort and is less tiring to handle. The saw stands safely on solid ground, and like any quality, chainsaw it also has an adjustable telescoping pole that extends up to 15 feet of overhead reach. You can power up this electric pole with the push of a button without dealing with smoke, fumes or costly tune-ups. Plus the built-in safety switch prevents accidental starting. Overall, this electric pole saw from Sun Joe is a very compelling product. Once you buy it, this is surely going to be the most used garden trimming tool from your collection. This Best cordless pole saw from Black+Decker is study and will definitely serve you for a long time. Battery cordless pole saws are considered the least powerful of all pole saws. But the 20-volt Black+Decker LPP 120 cordless pole saw has more cutting power than many others saws that are available in the market. With some real extension capabilities and lightweight, the pole is fully portable. With an 8 inch bar and chain, you will be able to achieve the maximum reach of up to 14 feet. This saw can be extended up to 10 feet which are the highest extension you can get from any cordless pole saw. The pole saw is incredibly easy to use, with low noise and lower vibration this saw is a dream to use. The popular cordless saw is very easy to disassemble and clean after the cutting which requires virtually no other maintenance. If gardening is your part-time hobby and if you are looking for a saw that is light and extremely easy to operate, then you will be really satisfied with LPP120. If you are looking for a jack-of-all-trades pole saw, the PoulanPro PR25PS pole saw is definitely the best choice. The gas pole saw is efficient enough to do the tasks of many tools in the convenience of one. Whether it is to cut branches, edge lawns, trim hedges, maintain your garden or simply blow debris off from your lawn, this pole can do it all. Instead of lugging a hedge trimmer, a ladder, an edger, a saw or even a blower into your yard to keep your garden well-trimmed, all you need is this pole saw and a few attachments. This Pole Saw fits perfectly into various attachments and gets started without much effort. The pole is 3-foot extension pole which branches and trims easily. The PR25PS pole saw has a removable section which allows you to cut the branches and take care of the edges at different lengths without having to move. Depending on an individual’s height, branches 12 feet in the air are attainable without a ladder. With an 8-inch low kickback bar and a chain, the gas pole is complete with an automatic oiler, which helps the chain to oil and lubricates itself without giving you much hassle. With SureFire Fuel Delivery System, you can start up the pole with a very little effort. 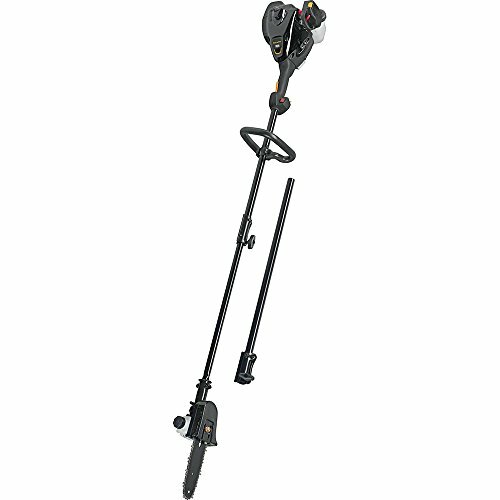 The Poulan Pro 967089701 25cc 2 Stroke Gas Powered Straight Shaft Pole Saw allows you to eliminate the need for lawn maintenance. It does a great job of getting laborious tasks accomplished with very little effort. Instead of having to lug a ladder against a tree to cut down some branches you can simply reach up to get those branches by attaching the extension pole to the saw. For lower branches, you can shorten the pole. So many features in one pole, which is definitely something you should buy for the beautification of your garden. Snow Joe is one of the most known gardening suppliers out there who always knows what to bring to the table. The electric chainsaw SWJ802E is an incredibly strong saw that is capable of standing toe-to-toe with any other entry on the list that we have here. This easy to handle chainsaw is only 7.9 pounds, with which you can safely stand on the ground. 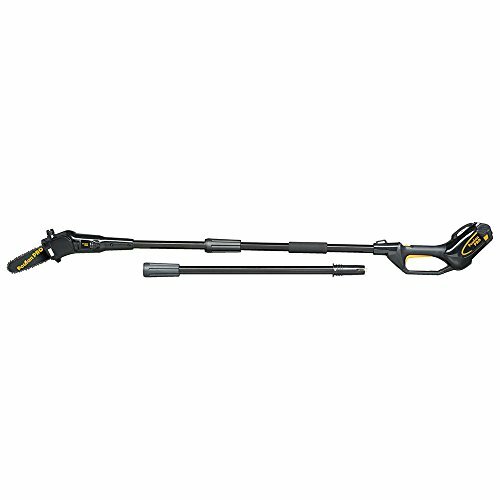 Extend the telescoping pole up to 15 feet to reach overhanging limbs. Powered by a 6.5 amp motor that can cut limbs up to 7.5 inches thick. This Pole Saw/chainsaw is very well made, featuring cord restraint hook that prevents dragging and potential injuries. The oil cap of this saw is very well positioned, and the collar makes adjusting the pole’s length very easy. 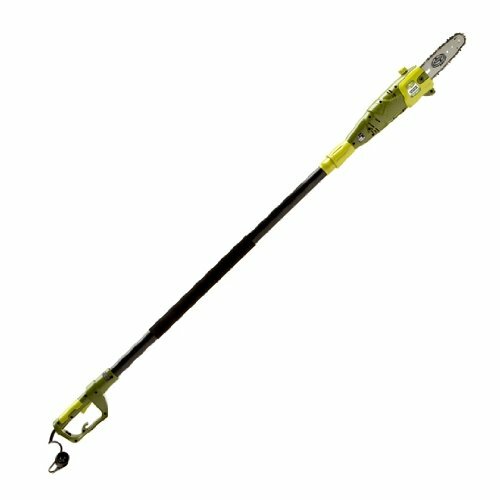 The unique feature of this pole saw is the multi-positioned adjustable head. The head can be adjusted to cut at 0, 15 or 30 angles. The variety allows one to cut difficult branches from the angle that may suit you better. The pole saw is powered electrically and powers up with a push of a button. The chainsaw is equipped with a built-in safety switch to prevent accidental starting. 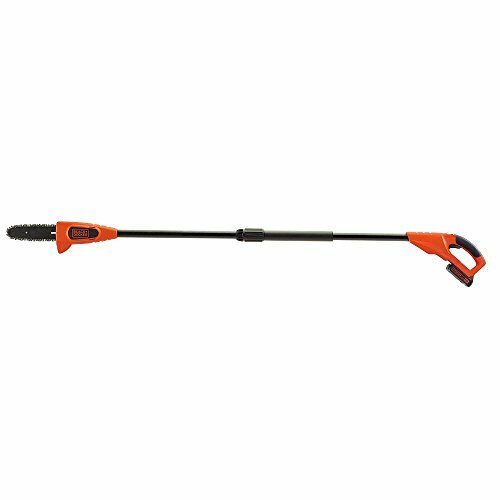 Gardeners who are looking for a pole saw which is extremely easy to use should aim for the SWJ802E electric chainsaw. A very affordable and well-rounded product that is quality build, affordable in price, lightweight and adjustable head making it the perfect saw for you. The Remington RM1025P is an electric pole chainsaw with a tool-less quick-change role that allows you to change back and forth from pole saw to chain saw. 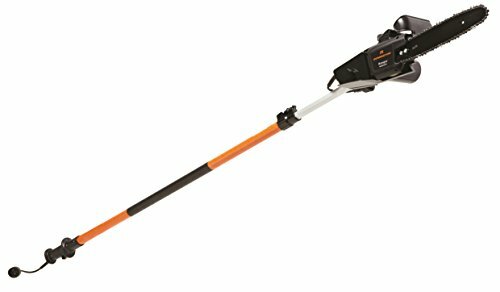 This electric chainsaw/pole saw combo is very well-made and powerful saw that can serve the regular maintenance of the medium sized garden. 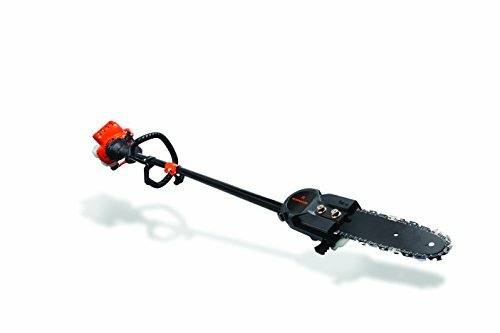 Featuring 8-amp motors and oversized 10-inch bar and chain, the saw can cut up to tree limbs which are 9 inches in diameter. This Pole Saw is one of the most popular pole saws available in the market with a combination of power and ease of use. The most versatile feature of this saw is you can attach and detach the saw whenever you want. So you can use this saw as a lopping, pruning machine with the chainsaw and also slice branches to the perfect size by quickly disconnecting it from the chainsaw. Now you can cut through overhead branches with less kickback easily with this combo saw. If you are looking for a product that has multiple uses, you have just got the right saw. This versatile tool is capable of successfully tackling more than one duty, giving you the comfort and pleasure to use. TrimmerPlus PS720 is perfect gardening gear for pruning and cleaning up your hard to reach trees and hedges. The performance of this saw largely depends on the trimmer you attach it to. When it comes to the point of attaching, TrimmerPlus PS720 offers a lot of versatility and options to play with. You can pair it with trimmer like Remington to cut thicker branches. The add-on TrimmerPlus PS720 pole saw can be used to trim branches on trees without using a ladder. The 8-inch bar and chain are lubricated with an automatic oiler to maintain peak cutting performance. Attaching the saw to the trimmer is extremely easy. Just put the coupler in place, turn the knob, and you are ready to trim. Another great feature is, the saw includes the automatic oiler, which means it doesn’t require manual lubrication. When you attach this saw with a trimmer, you can reach up to 12 to 13 feet, which is a good height for residential gardeners. This Pole Saw doesn’t require much maintenance, keep the pole clean and keep the chain from damage time to time. And that is it. If you already have a good quality trimmer but also need a saw to play with a different setting, then TrimmerPlus PS720 is the best option for you. This saw can give you a lot of options to play with. But remember the performance of the saw mainly depends on the quality of the trimmer it’s attached to. The saw may underperform if it mismatches with the trimmer. This is an ideal trimmer if you are looking for gardening equipment to expand your collection. With string motor and lithium-ion battery, Poulan Pro 967044201 is a high-quality power tool for your garden. The pole saw has an 8-inch cutting bar that delivers superior cutting performance. The motor of the pole saw is strong and gives you the power you need for all your cutting, pruning and trimming needs. The saw is easy to start with just a touch of a button, and there is an over-mold grip handle which provides comfort and overall operator control. There is also a front adjust chain tensioning system for which the chain does not come loose while you are cutting. The automatic oiler helps the saw to run smoothly, and the oil level indicator shows you when the oil needs to be refilled. Overall this is an excellent trimmer for residential use. Although not at all ideal for heavy duty cutting. The pole saw is ergonomically designed for maximum comfort, weight, and performance. If you are a passionate gardener, this pole is the right pick for you as you can enjoy it for many years. When you need to cut high branches and the small tree. 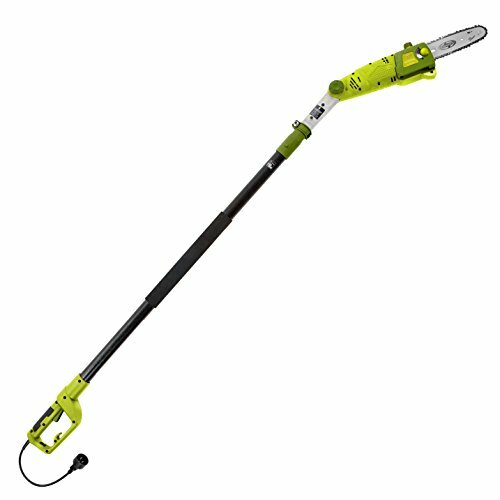 This 8-amp corded unique and multifunctional electric pole saw offer consistent performance and power. You can reach higher limbs by attaching the 8-foot extension pole without using any ladder. You can also detach the pole to further chop up the fallen limbs. The pole attached to no tool for which the transition of it from a chainsaw to pole saw is quick and convenient. The patented auto-tension system extends the life of bar and chain without much maintenance. In addition, the WORX WG309 has an automatic oiler provides lubrication from the reservoir with an oil level indicator, which makes it easier to operate and maintain. The 10-in cutting bar and 10-in max cut diameter make this the perfect saw for light to medium duty trimming. This Pole Saw is only 10 pound in weight which makes it incredibly lightweight and compact, thus allowing you to work for an extended period of time. The low kickback bar feature of the saw and chain provide additional safety. Overall, the pole will always perform flawlessly. The saw is extremely easy to assemble. People highly recommend this pole for its efficiency to cut through branches without giving much energy. Simply, a pole saw is a saw connected to the end of an extended pole. The purpose of all kinds of pole saw is to cut small branches, mainly for pruning, and also for general shaping of a tree. This tree trimming device should not be confused with a methodical chainsaw. A regular chainsaw is a mechanical saw which is highly effective and efficient in cutting a tree and its branches. Chainsaw is mainly used for after storm clean up or to take off large branches. Why Use A Pole Saw? The pole of the pole saws is usually between 8 to 14 feet, which allows them to reach maximum 20 foot. These saws are perfect to cut the unwanted thick tree branches up to 12 inches in diameter in general. The thick branches cannot prune with pruning saws, shears or pruning loppers. With a pole saw you can reach to remove those branches that normally requires a ladder, which saves your time and you finish your pruning task with less effort. You trimming becomes far easier with a pole saw and particularly with a powered pole saw. The pole saws are not only good at cutting the high branches, they also give you much better control and precision in cutting. Pole saws are light in weight and their balanced weight plays an incredible role in cutting the branches with much ease. Not all pole saw performs the same way, some of them excel in one area and some of them in another. They are eco-friendly and fuel-efficient, as they are operated by small engines. Like every other home and garden products, there are varieties of pole saw available in the market. Pole saws have become increasingly popular in the wide range of people including homeowners, gardeners, landscapers, arborists and people like you. If you have a need to cut or trim any tree, you probably need a Pole Saw Advisor. Currently, there are four types of pole saw available on the market, let’s have a look at them. This is the very basic form of a pole saw with an attached blade that can be extended to cut tree limbs. Very few homeowners and landscapers still use this old-fashioned manual pole saw. Manual pole are not as popular as other types of pole saw as it takes much time and effort to complete the cutting task. If you want a pole saw at an affordable range you can try buying a manual pole saw as they are still a great choice for minor trimming. Corded electric pole saws are ideal for homeowners with small to medium sized yards. They are extremely easy to use and light in weight. They are ideal for cutting branches that are tough or too thick. Electric pole saws are more powerful than cordless pole saw and make less sound than gas pole saws. The only disadvantage with the electric pole saw is, due to their cord you only have a limited operating distance. And also they are not as powerful as a gas powered pole saw. They are the most convenient pole saw and getting better each day. One can operate cordless pole saw almost from anywhere. They are usually equipped with a lithium-ion battery which is normally sufficient for small jobs around the house. If you are planning larger trimming jobs with a cordless pole saw, it would be wiser to keep some extra battery packs with you. From all the kinds of pole saw available in the market, gas powered pole saws are the most powerful and efficient one. They are designed to heavy-duty powerful trimming task and can cut through thicker branches. 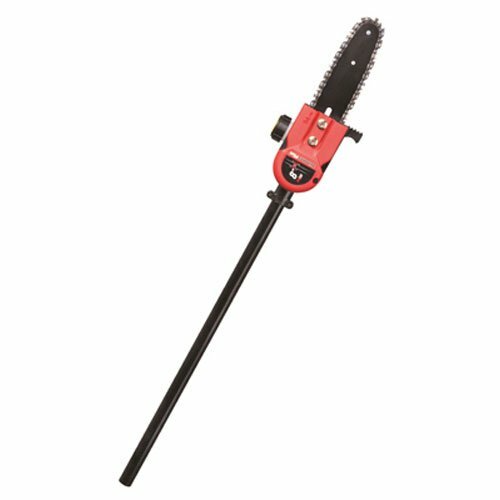 Gas powered pole saws can operate for hours and mainly preferred by professional landscapers. The downside of this pole saws is that they are heavier and louder. The price of this pole saw is a little higher than electric models. If you have a large property that needs regular maintenance, you probably need a gas powered pole saw. The pole of the pole saw comes in various length and mostly they are made of steel or fiberglass. Choosing the right length of the pole is very important. Sometimes the usage of the long pole is difficult and the price is also high. We recommend, pole length to be between 7 and 15 feet, which is good enough to perform this job more than efficiently. Besides single length pole, there are extending pole available on the market. These adjustable poles are easy to store and works well on trees of varying heights. The bar is the steel plate area where the chain travels around. It is measured mostly in inches and refers to the length of the bar. The longer the bar, the more cutting ability your pole saw will have. Choose a bar length that is greater than the thickness of the branch that you target to cut. We recommend bar length to be between 6 and 12 inches depending on your requirement. We highly recommend choosing a pole saw the least weight but also without compromising their key features or engine powers. All most all the top pole saw brands offer full or limited time warranties on their product. Since repairing a pole saw can cost as much as buying a new one, it is advisable to go with a model that has the longer warranty. The cutting power of the pole saw mainly depends on the saw’s motor power and efficiency. Strong cutting power poles ensure that the blades cut through the words smoothly and jerk-less. Your regular maintenance can help your pole saw to stay fit and perform efficiently just like the way it did on the first day. Don’t forget to clean your equipment with a damp cloth after each use. Also, keep your pole saw in a well-ventilated dry place between uses. We have reviewed several products from various brand to empower you with details and facts about buying the best pole saw 2019 to help you take the right decision. Also, keep that in mind that your personal needs determine the right pole saw for you. Make sure you pole saw has enough power to cut the size of wood you need to cut. Make sure the one you choose has great safety features and not too heavy. No matter which one you buy, the first thing you must do before you start using it is to read the manual guide thoroughly. Assemble the pole saw (if needed) correctly, put on your safety gear, make sure your safety equipment is working properly. Make sure the chain correctly tensioned. Educate yourself on the proper steps to take before you start. Thank you for taking the time to read this best pole saw 2019 reviews and buyer’s guide.